September is turning into a glorious month here in the mountains of Southwest VA. Take advantage of this beautiful time with an afternoon spent outdoors listening to jazz music, induldging in a wine and cheese basket and soaking up the last rays of summer. 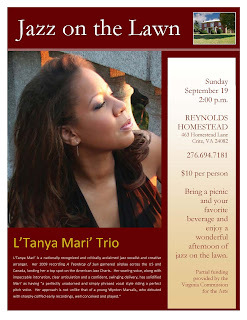 Jazz on the Lawn will be held at Reynolds Homestead on Sunday, Sept 19 at 2 pm. Cost is $10 per person. This afternoon of music will feature renown jazz vocalist, L'Tanya Mari' Trio. L’Tanya Mari’ is a nationally recognized and critically acclaimed jazz vocalist and creative arranger. Her 2009 recording A Teardrop of Sun garnered airplay across the US and Canada, landing her a top spot on the American Jazz Charts. Her soaring voice, along with impeccable intonation, clear articulation and a confident, swinging delivery, has solidified Mari’ as having “a perfectly unadorned and simply phrased vocal style riding a perfect pitch voice. Her approach is not unlike that of a young Wynton Marsalis, who debuted with sharply-coiffed early recordings, well conceived and played.” To hear a selection of her music, visit www.ltanyamari.com. So plan a trip to the Blue Ridge Mountains, enjoy an afternoon of incredible music, and spend the night in one of the Inn's luxurious guest rooms. What better way to start the fall season.